I am a big fan of costume design and have written articles for Clothes on Film, Christopher Laverty’s excellent website devoted to costumes for movies and TV. I highly recommend a visit to read interesting pieces on costume design as well as interviews with the costume designers who give the films you love their sartorial flair. Peter Sarsgaard and Cate Blanchett in a scene from Blue Jasmine. I thought it was an interesting piece of costuming work to have a gorgeous white Chanel jacket help tell the tale of the downfall of a Manhattan socialite whose world has come undone. The selection by the film’s costume designer Suzy Benzinger of a Chanel jacket is heavy with symbolism and my article traces why, by way of a great interview Benzinger gave to The New York Times’ Guy Trebay. James D’Arcy and Andrea Riseborough in a scene from W./E. Oh did I love the costumes (and jewelry!) in this movie! Arianne Phillips, the costume designer, richly deserved the Oscar nomination she got for her work on this film. 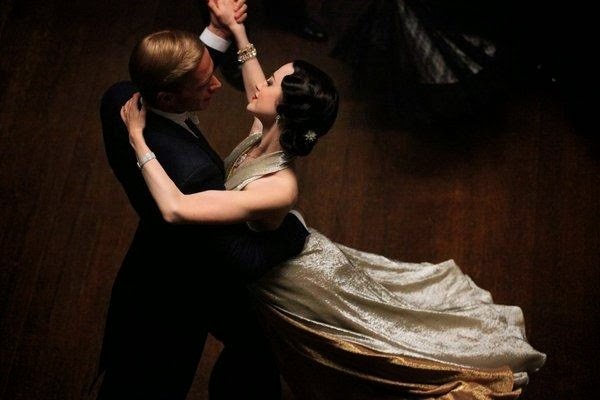 The article explores the glamorous look of the 1930s that winds through the two love stories in the movie. Don’t you love the two-tone gold lamé gown that Andrea Riseborough, as Wallis, wears, above? The hilarious scene when Sandra Bullock proposes to Ryan Reynolds in The Proposal. I loved the simple, but luxe, look on Sandra Bullock in this romantic-comedy co-starring Ryan Reynolds. The film’s costume designer, Catherine Marie Thomas, was a delight to interview and was kind enough to share sketches of the vintage wedding dress she designed for the movie, as well as details into her design process, and why Sandra wanted her character, Margaret, to wear such a long, tight skirt (shown above) in the film’s opening. Such a great scene: Kate Hudson in a Paris lingerie shop in Le Divorce. Trench by Chloe! Anybody who has been reading this blog for awhile knows I have the merest hint of an obsession with the Hermès Kelly. Might this be the movie that started it all for me? I had the privilege of interviewing Carol Ramsey, the film’s costume designer, who gave me fascinating insights into how she clothed an entire all-star cast with help from many designers, who lent pieces for the production. And the to-die-for bag Kate carries in the movie? On loan from Hermès. My favorite part of the interview was when Carol recalled being in the Paris Hermès showroom with James Ivory, the film’s director, whose main concern about the Kelly was this: “Can we fit a gun in it?” Hilarious! Read the interview to find out why. I can’t talk about that red crocodile Kelly that Kate Hudson carried in the movie. I might weep over my love for it. Be still my heart: a red crocodile Hermès Kelly that Kate receives from her would-be lover in Le Divorce.